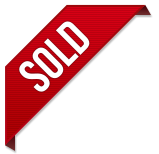 The home has recently been renovated throughout to a high standard with nothing remaining to be done, simply move in and enjoy! The stylish two bedroom home features spacious open plan living areas with wood-effect plank vinyl flooring and bay windows. The north facing windows have tinted glass, plus there are both Panasonic reverse cycle air-conditioning and ceiling fans. 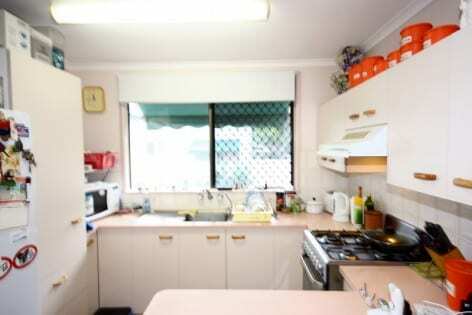 The large kitchen has ample storage/cupboard space with peach coloured laminate bench-tops/work surfaces and matching pale peach panel doors. The kitchen is complemented with tiled splash-backs, stainless steel sink and a Westinghouse gas stove with fan forced oven and grill. 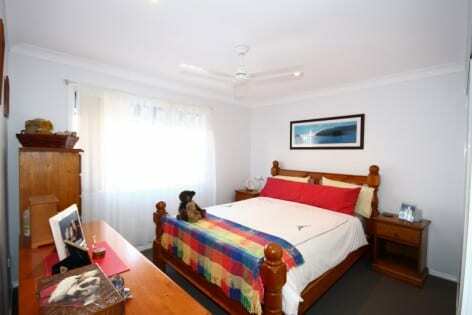 The two carpeted, good-sized bedrooms have built-in robes; master with its own reverse cycle air-conditioner. 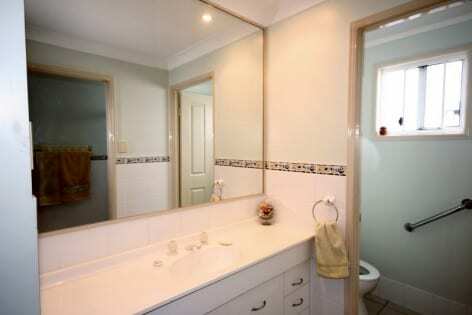 The tiled bathroom comprises of a shower cabinet recess and vanity unit with separate toilet. 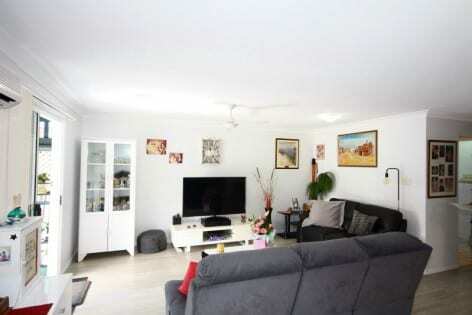 The home has an internal laundry and a gas hot water service. 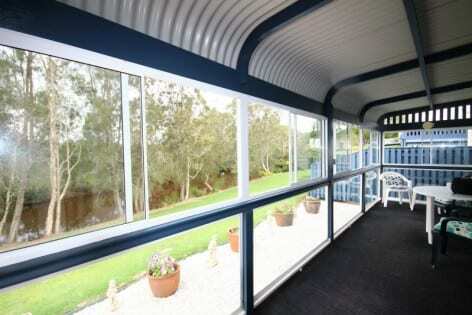 A large carport with plenty of headroom adjoins the side of the home. 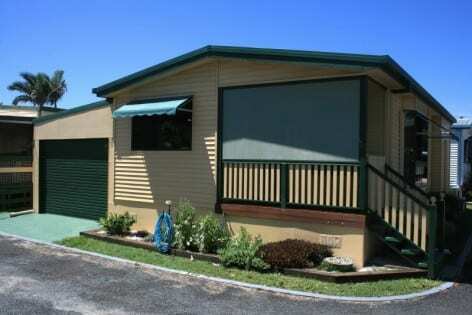 The carport has a remote operated roller door and parking for two good-sized vehicles. 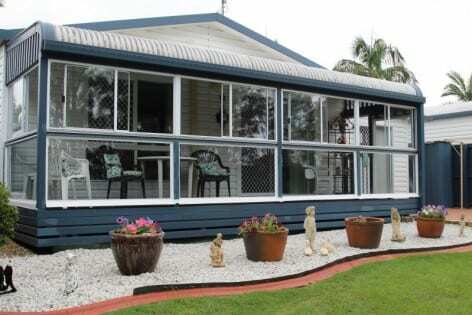 The home is located in a very quiet area of the park and your 4-legged companions are very welcome. 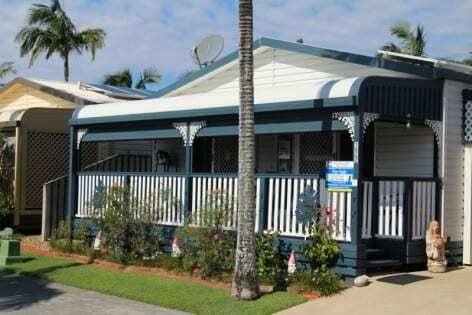 Fully renovated and immaculately presented home with much appeal – coming soon! 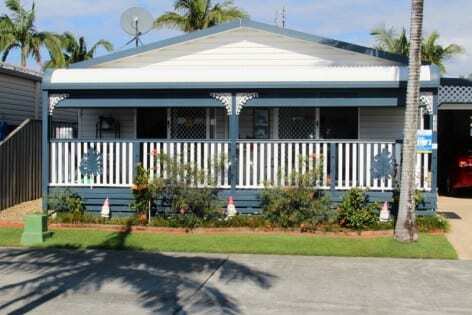 The home features a full width entrance porch with a bull-nose roof and privacy screens. 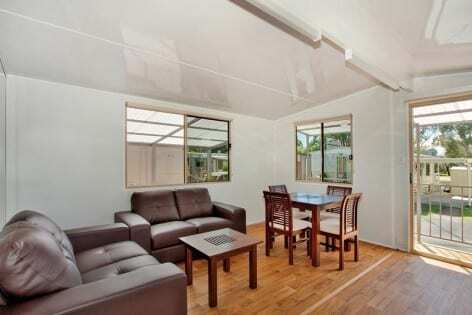 The spacious open plan living areas have recently had timber effect vinyl flooring laid. 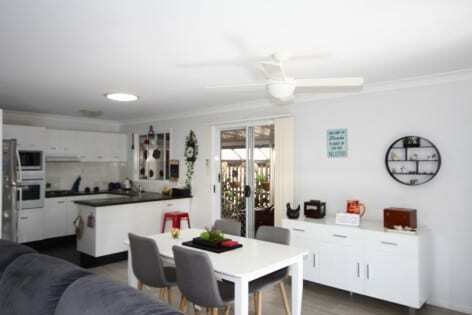 Plus, there are ceiling fans and reverse cycle air-conditioning for comfort. 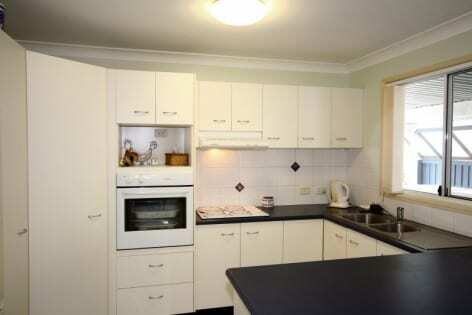 The tiled kitchen has a skylight for natural light, with plenty of storage space. Work surfaces/bench-tops have recently been upgraded to dark onyx laminate with contrasting, cream coloured flat panel doors with stainless steel handles. 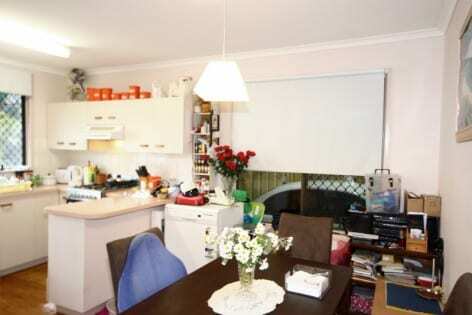 The kitchen is complemented with an electric built-in Simpson fan-forced oven/grill, a gas cook-top, LG dishwasher, tiled splash-backs and a double stainless steel sink. The tiled 3-way bathroom consists of a shower room with shower cabinet, dressing area with vanity unit and a separate toilet. The tiled laundry is located in an external building at the rear of the carport. 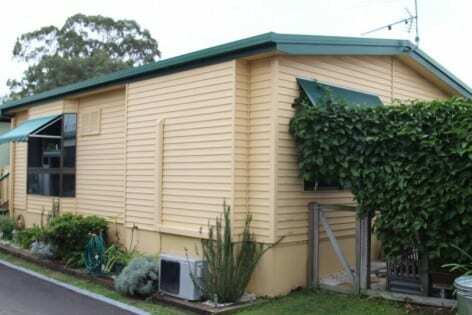 A single carport with stencil-crete floor and remote operated roller door adjoins the home and at the rear of the home is a very private and secluded, paved courtyard with a timber perimeter fence. The home has a recently had a new electric hot water service installed and there are solar panels with an inverter. 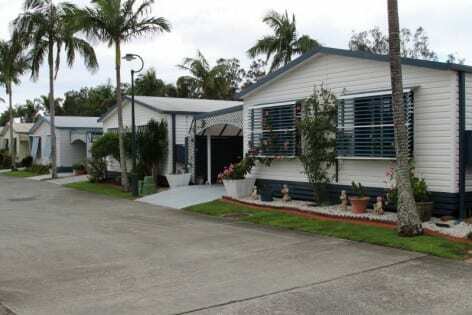 This spacious and immaculately presented 13 metre manufactured home is located in a highly sought after area of the village. The home features a fully enclosed sunroom/conservatory with outlook over park land, the village’s walking track and across to the reserve. 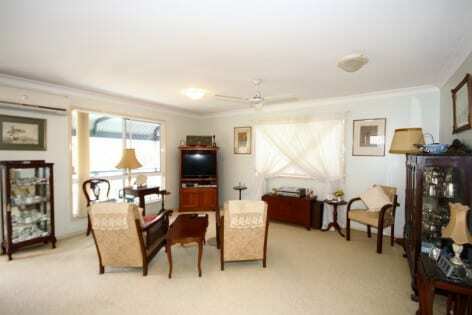 The home has recently been renovated and redecorated to a high standard with no expense spared. There is nothing remaining to be done, simply move in and enjoy! The newly carpeted open plan lounge and newly tiled dining area and kitchen has a verandah door opening to the sunroom/conservatory. 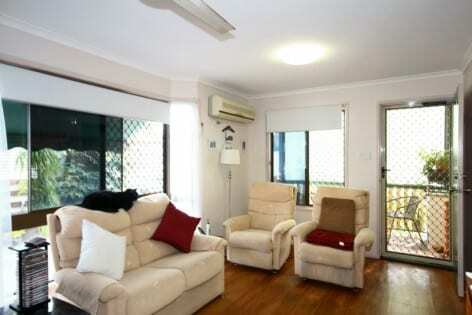 The generously-sized living area has both ceiling fans and a Fujitsu reverse cycle air conditioning. 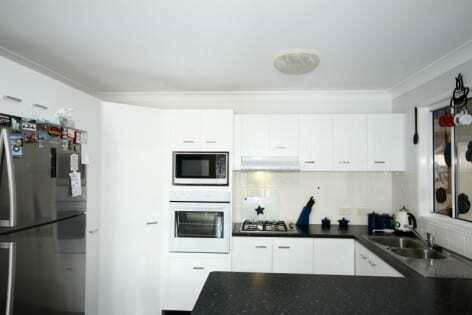 The large and fully renovated kitchen has plenty of storage space with dark onyx laminate bench-tops/work surfaces and sparkling white doors with stainless steel handles. The kitchen has tiled splash-backs, a double sink with water filter and is complemented with a built-in Chef oven/grill, gas cook-top, new range hood and a Fisher & Paykel dish-washer. 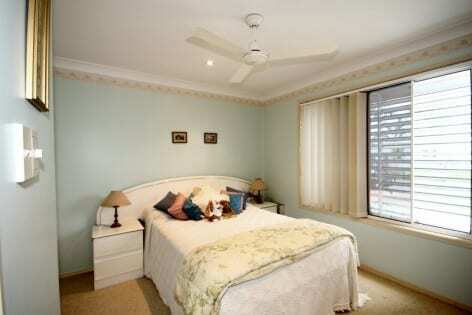 The two good-sized newly carpeted bedrooms have built-in mirror door robes and ceiling fans. 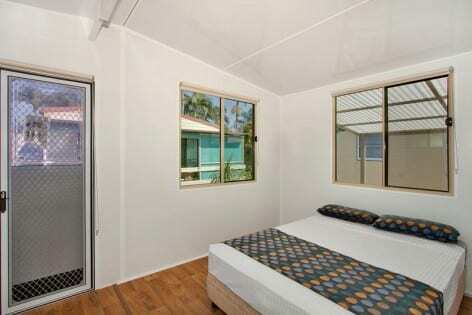 Master bedroom has its own reverse cycle air-conditioner. 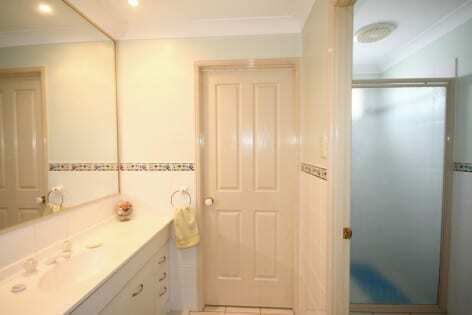 The fully tiled bathroom consists of a corner shower cabinet, vanity unit and toilet. Plus, there is a separate guest toilet. 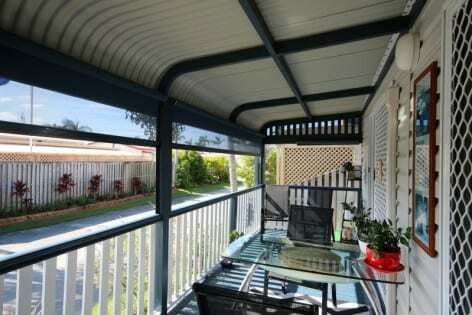 Adjacent to the home is a carport with a stencil-Crete floor and space for two vehicles. 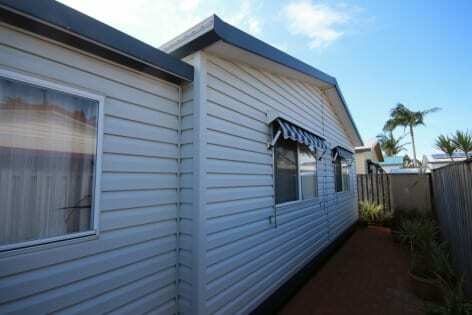 The laundry is located in a large external building located at the rear of the carport. 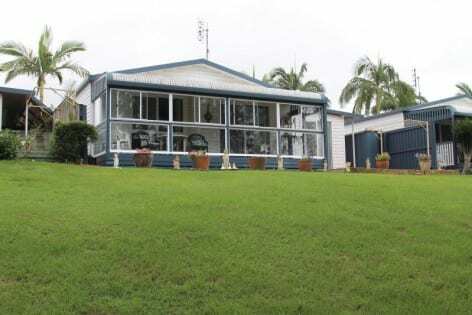 This charming home features a large verandah with a timber deck, making it ideal for those who like to enjoy an outside lifestyle in private surroundings. 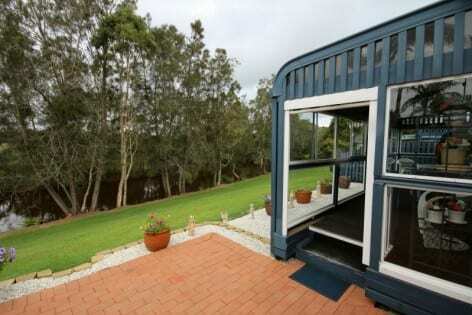 The home is situated on the park’s perimeter with an outlook over lush green grass across towards the river. The light and airy home has recently been redecorated and timber laminate flooring has been laid throughout the living area and bedrooms. There is nothing remaining to be done, simply move in and enjoy! 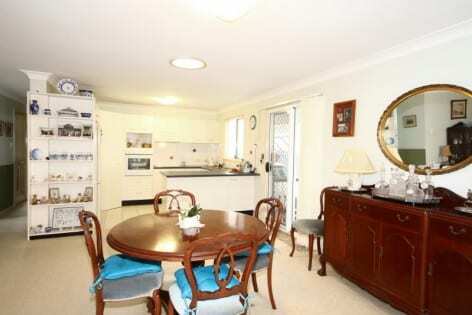 The home comprises of an open plan lounge and adjacent kitchen with dining area. 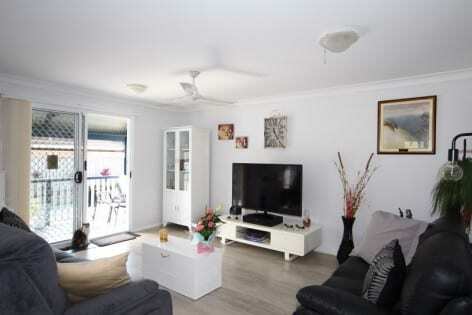 The living area has a reverse cycle air-conditioner, ceiling fans and a door in the lounge area opens to the generous verandah. The modern kitchen has plenty of storage and light coloured stone-effect laminate bench-tops/work surfaces with timber veneer doors and an almost new Chef gas stove. 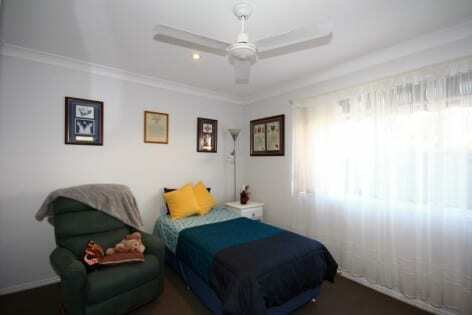 The home has two good-sized bedrooms with built-in robes; master with ceiling fan. 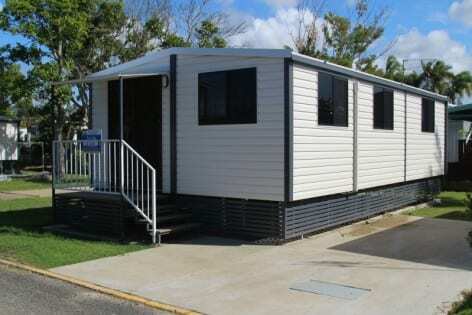 The tiled bathroom consists of a shower cabinet, vanity unit and toilet; plus laundry facilities are provided in the bathroom. 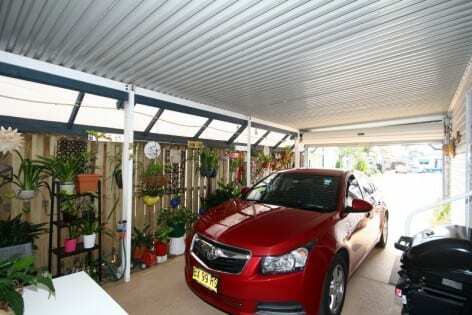 A carport with good headroom and space for two small vehicles adjoins the side of the home. There is a garden shed and an electric hot water service. 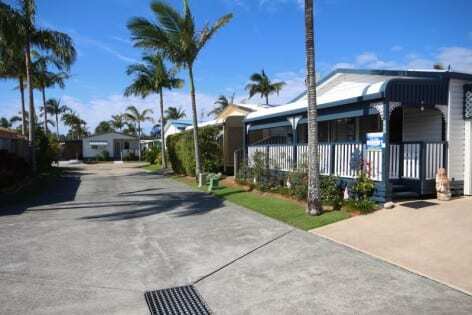 Absolute waterfront positioned manufactured home. 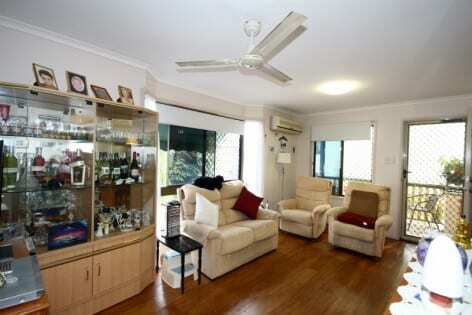 The stylish two bedroom home features a large private rear verandah with views across Chinderah Lake. 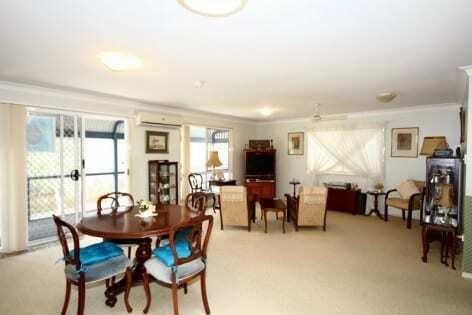 The home boasts spacious open plan living areas with bay windows and lake views. 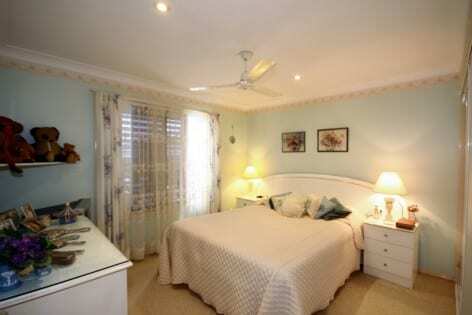 The master bedroom has a verandah door opening to the newly constructed and well-proportioned verandah. The fully renovated and stylish kitchen is complemented with a new Smeg gas stove, grey/black onyx laminate bench-tops/work surfaces and has 2-pac sparkling white cupboards and drawers. 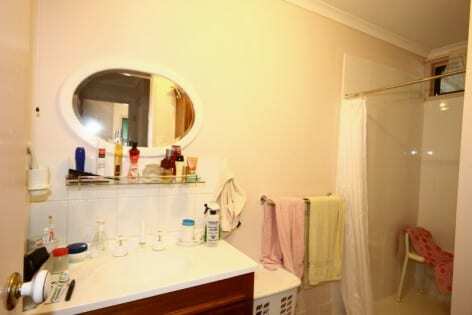 Bathroom consists of a shower and vanity with separate toilet. 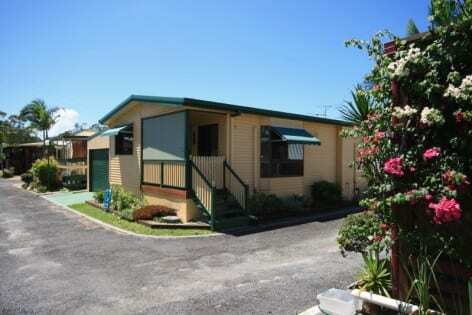 Laundry facilities are provided in the bathroom which has an external door opening to the single carport. 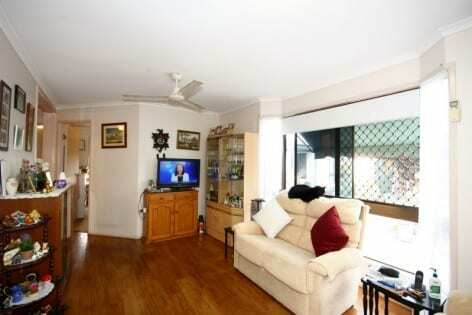 The home has recently been renovated throughout to a high standard. 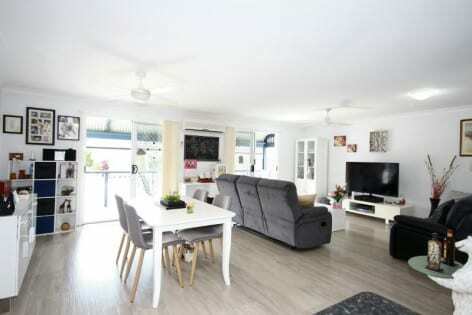 The renovations include a new split-system air-conditioner in living area, new vertical blinds and new timber laminate flooring throughout the home. 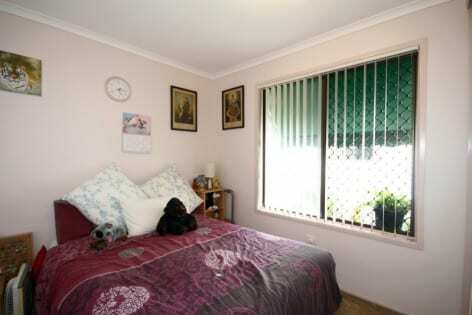 Gateway Lifestyle Tweed Shores is a pet friendly residential park. 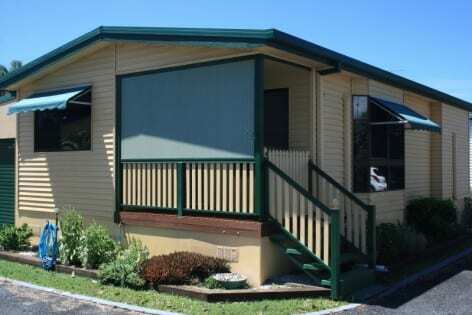 This spacious manufactured home is located in a very quiet and highly-sought after area in this impressive park. 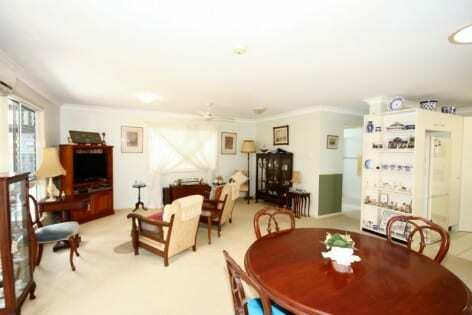 This immaculately presented home is just a short stroll to the bowling green and swimming pool. 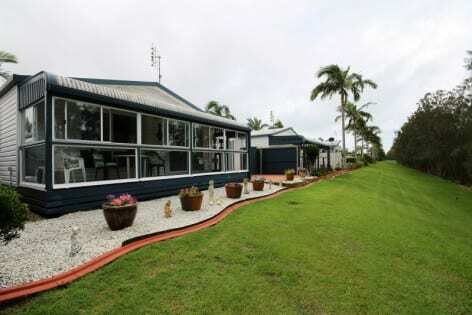 The home features a spacious open plan lounge/dining area and kitchen that has a door opening to the verandah that runs the full width of the home with uninterrupted grand views of the canal and parkland. The tiled kitchen has plenty of storage space and work surfaces/bench-tops with dark green onyx laminate and contrasting, off-white coloured flat panel doors with stainless steel handles. 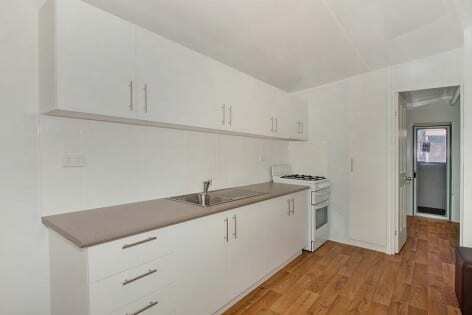 The kitchen is complemented with a built-in Simpson fan-forced oven/grill with cook-top, tiled splash-backs and a double stainless steel sink. The home has two good-sized, carpeted bedrooms with ceiling fans, tinted windows, privacy screens and built-in robes with mirror doors. 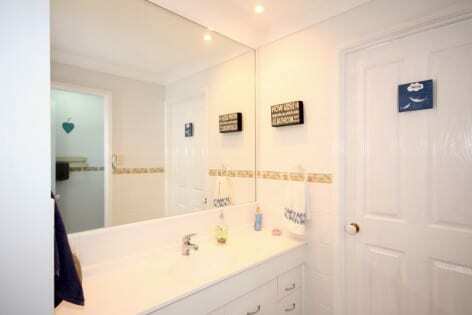 The 3-way tiled bathroom comprises of a large shower cabinet, a separate toilet and a separate area with a large vanity unit. 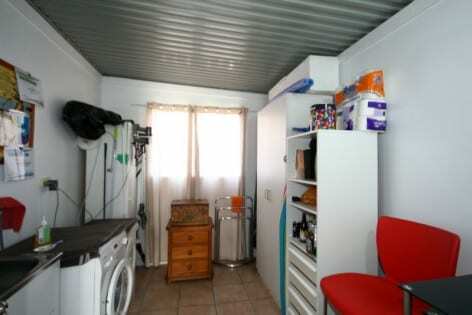 The home has a laundry located in an external building at the rear of the carport. 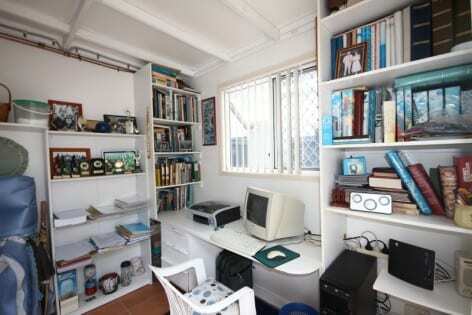 The laundry has been tiled and fully lined; it may be used as a study or hobby room. 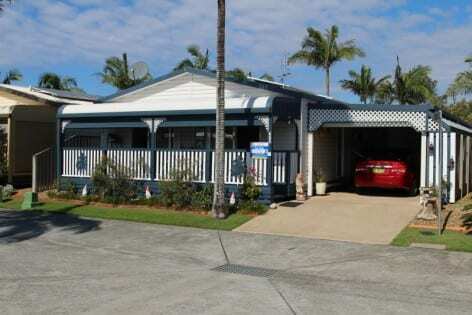 A single carport with good headroom door adjoins the home with a gently sloped ramp leading to a Juliet balcony and the side entrance.